In the beginning when we first seen this photo the first thing that came to mind was kingly. This golden bowl, bucket, or goblet was kingly in our eyes. It seemed to be some sort of hybrid creature like a bull with wings. The more we analyzed this treasure we all agreed that it looked like some sort of ern. Then when we figured out what it actually was we were a little surprised, but still thought it was so obvious. This was actually a Gold beaker from about 1000 B.C. This beaker was found from a grave at the site of marlik near the Caspian Sea standing 17.5 CM. The beaker is very well crafted in detail from the rim speckled very specifically. This is where line is used. The griffin like creature also is very mesmerizing as the three heads poke out. It is very detailed and gives out a rich vibe. Gold is the main attraction to the piece to symbolize royalty or richness. This is what attracts my eye is all the gold and the heads poking out. This is different and immediately captures my attention. The beaker is as symmetrical as it can be for being hand crafted. So that balances out so nothing is taken away from the harmonious beauty. The artist’s medium is to show the person that was buried was royal, and to do this they made it out of gold and with a powerful design. The artists does a good job incorporating this feel and medium into the piece. The feelings I get from this piece of art is very highly. It makes me feel kind of mystical in a sense there must be a bigger story behind this. 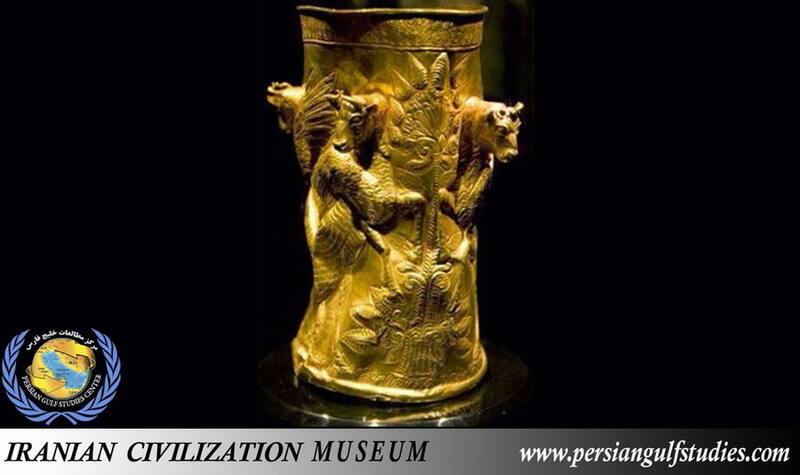 But for now this piece is held in the National Museum of Iran.